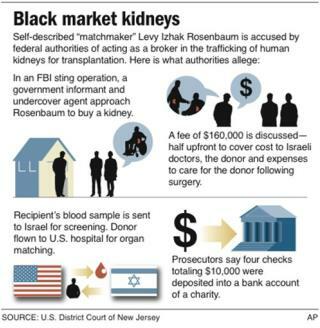 Graphic explains kidney-selling scheme that Levy Izhak Rosenbaum is accused of arranging. (Newser) – The FBI says it's made the first organ trafficking arrest in US history, a strange byproduct of the sweeping corruption probe that nabbed dozens of New Jersey officials and rabbis, the Star-Ledger reports. Levy Izhak Rosenbaum is accused of dealing in kidneys: He'd buy them from donors in Israel for $10,000, then sell them to clients in the US for up to $160,000, says the criminal complaint. Okay, silly question. Is it considered Black market buying a kidney from the source and selling it only because the Hospitals are getting their fee?